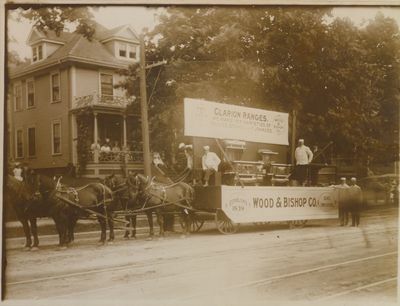 "Wood & Bishop Co. Bangor Carnival Parade Float, June 18, 1912"
Charles H. Wood served as president of the company. Bishop is not identified in the 1912 Bangor city directory. Wood & Bishop operated at 40-42 Broad Street in Bangor. An insert ad in the city directory reads: "Clarion ranges, stoves, and furnaces give results that cannot possibly be obtained with carelessly made goods. These are economical, because they are accurately fitted to control the draft -- durable, because they are made of the choicest of new iron -- convenient, because of their many special improvements. Also sold by S.H. Woodbury Co., Brewer / E.A. Blanchard Co., Old Town / E. H. Rowell, Hampden / Parady & Luro, Orono"
Photograph reads: "Clarion Ranges. We make 107 varieties of ranges, stoves, and furnaces." Also "Established 1839" and "100 employees."